On my last trip to San Antonio, my salon manicurist (who does great pedicures), told me about a nail supply store in the middle of nowhere, so I went to check it out. It was like I died and went to Heaven - I wish I had taken pictures. The small shop was stuffed full of nail polish - everything from OPI to China Glaze... and oh the China Glaze. They had so many bottles of old polish (dusties) but the newest items looked to be the Up & Away, and they didn't have many bottles of it. I grabbed this bottle because I'm a sucker for blue flashed whites but it wasn't until I got outside that I realized this was a sheer. China Glaze Tease is from the Blush collection and is not big 3 free, but I don't mind that. However, if you're looking for a big 3 free polish, I do believe this is a dead on dupe for their color Rainbow. I'll have to comparison sometime. I used a base of Seche Natural, 3 coats of Tease and a top coat of Seche Vite. The color is very sheer but as you can see in the sun, you do get the blue flash. The formula on this was great - not runny or thick despite the original layer of dust on my bottle. A whole lotta nothing. However, I bet this would look great over black, or really it's a nice understated color - might go well as a french manicure too. In the shade, you also get that blue flash. 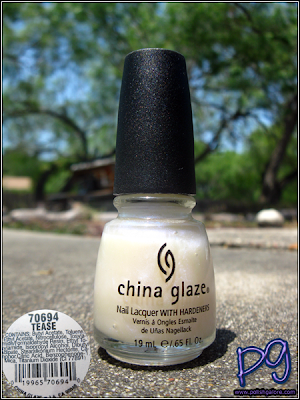 China Glaze [official website] can be found online through several etailers, including my favorite Head2Toe Beauty [official website], Sally's Beauty Supply [official website] as well asTransDesign [official website]. Even though it's sheer, that's an awesome color. As I was looking at the first picture, I thought to myself "that would look awesome over black." I scroll down a little farther and you said the same thing, haha. Great minds think alike. Oi! I'm glad you swatched this one. I keep seeing people referring to shade but I never know what it looks like really. I think I'll pass on this one. Maybe a top coat glitter over it would work as well?